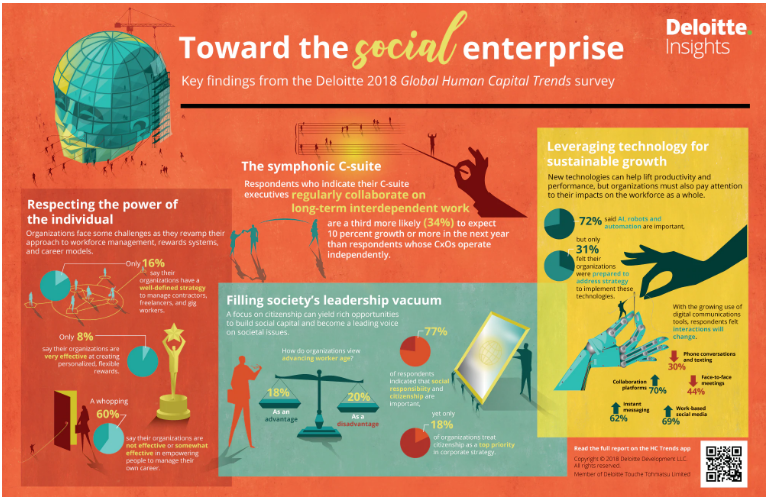 Based on a global survey of more than 11,000 business and HR leaders, as well as interviews with executives from some of today’s leading organizations, the fundamental change from business enterprises into social enterprises is showcased in the 2018 Deloitte Global Human Capital Trends report. This shift reflects the growing importance of social capital in shaping an organization’s purpose, guiding its relationships with stakeholders, and influencing its ultimate success or failure. 'A social enterprise is an organization whose mission combines revenue growth and profitmaking with the need to respect and support its environment and stakeholder network. This includes listening to, investing in, and actively managing the trends that are shaping today’s world. It is an organization that shoulders its responsibility to be a good citizen (both inside and outside the organization), serving as a role model for its peers and promoting a high degree of collaboration at every level of the organization'. Among the factors contributing to the rise of the social enterprise, the report points to three powerful macro forces driving the change: the growing power of the individual, with millennials at the forefront, secondly businesses being expected to fill a widening leadership vacuum in society, and thirdly technological change with unforeseen impacts on society even as it creates massive opportunities to achieve sustainable, inclusive growth. The report goes over the differentiators for an enterprise to behaving as a social enterprise: to listen carefully to the external as well as the internal environment—not just business partners and customers, but all parties in society that an organization influences and is influenced by, to invest in the broader social ecosystem, starting with an organization’s own employees, and aslo to actively manage its position in the social ecosystem by engaging with stakeholders and strategically determining and pursuing the kind of relationship it wants to maintain with each. Please find here the full article for a thorough reading. The article was published on Deloitte website on March 28, 2018 here: https://www2.deloitte.com/insights/us/en/focus/human-capital-trends.html?id=gr18_hc_trends.